Galapagos green sea turtles are not unusual companions to swimmers and divers. Their peaceful manner and calm way of swimming around transmits a sense of tranquillity, completely in tune with the flow of the ocean around them. In the Galapagos Islands, sea turtle sightings are pretty common, but to see them nesting or to get the opportunity to see their eggs hatch is quite rare. With any luck, it’s possible your Galapagos cruise might coincide with this magical event. The month of May is actually the time of year when newborn Galapagos green turtles leave their cozy sand nests and find their way to their new home – the open sea. Mother Galapagos green sea turtles can lay anywhere from 50 to 200 eggs during a period of up to three hours. Female sea turtles are the only ones that come ashore for this process. To do so, however, they have to find a sandy beach – a goal which in the Galapagos can be tricky due to its predominantly volcanic terrain. After carefully laying her eggs she covers up the hole with sand. Some female Galapagos green sea turtles have been observed making a false nest next to the original one in order to fool predators. They also try to cover traces of their presence by spreading some sand around the area of the nest. Finally, nesting only happens at night so as to avoid daylight predators. Female Galapagos green sea turtles are extra careful before going ashore to lay their eggs – if they feel threatened, they will stay in the water until the beach is safe. 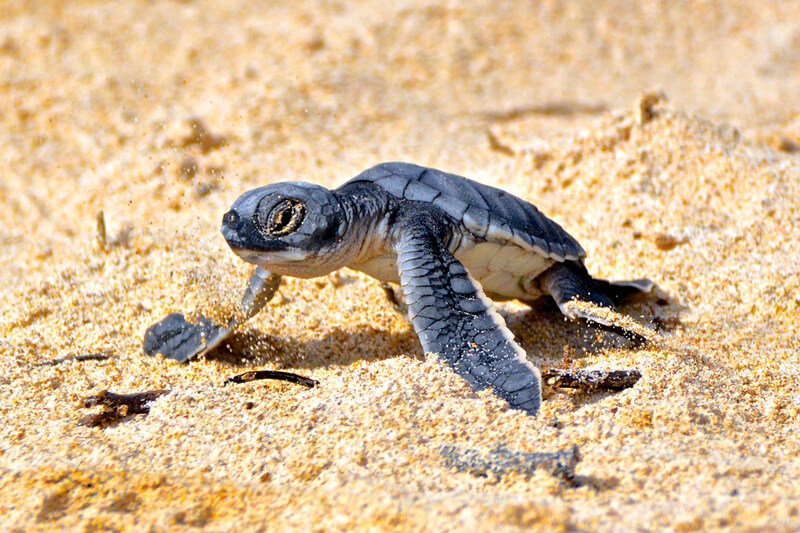 Baby Galapagos green sea turtles begin to hatch after 45 to 70 days. With the help of a small and temporary tooth that’s located on their snout, they break through their shells. Yet hatchlings do not leave their nests right away. Instead, they remain in the nests for a couple of days while absorbing the yolk from the eggs through an umbilical cord. This will be their first source of energy and will aid them on their first journey ever, from the nest all the way to the sea. Like their mothers in reverse, hatchlings will move out of their nests at night so as to avoid predators. The night sky also serves as a guide, allowing them to see the reflection of the water a lot better. Very quickly, baby sea turtles will scamper into the ocean and begin swimming for nearly 24 hours while trying to get as far away from the coast as possible. They will not get close to the coast for many years. If they make it to the ocean, baby green sea turtle will gradually begin to eat a number of things that range anywhere from molluscs and crustaceans all the way to sea weed, jellyfish and even fish eggs. Unfortunately, their young appetite is so intense that sometimes they accidentally end up ingesting bits of garbage and debris. As they grow older, sea turtles might even begin to feed on the leaves and bark of the red mangrove in the Galapagos. It’s not uncommon to find older sea turtles searching for seaweed along the coasts of islands, where the plant tends to be abundant. Growth rates for sea turtles tend be very slow. Juvenile sea turtles (roughly 40-50 cm in length) grow about 1 cm a year. Any sea turtle that’s bigger than that will grow at a rate of about 0.3 cm per year. This rate of growth diminishes as the sea turtle gets closer and closer to sexual maturity. Hatching season typically takes place at Puerto Egas, Gardner Bay and Cormorant Point (click on these to check our itinieraries for these spots! ).